After originally coming to London as an aspiring artist Cecil French (1879-1953) found his niche as a writer, poet and, perhaps most significantly, as a collector. 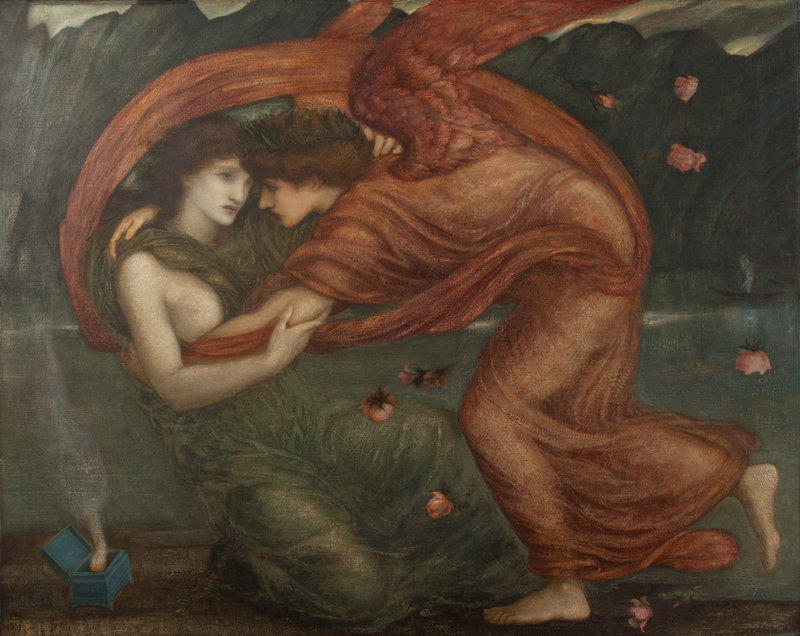 With a taste for Romantic art the collection French amassed focussed on the Pre-Raphaelite painters, the majority of which are by his favourite artist Edward Burne-Jones (1833-98). Upon his death he entrusted his friend Rowland Alston (then Curator of Watts Gallery) with dividing the artworks between worthy British institutions, giving a large portion to Hammersmith & Fulham Council. 26 paintings and drawings from that collection are on display here, most of which have been taken from the stores and conserved by the gallery for this exhibition. 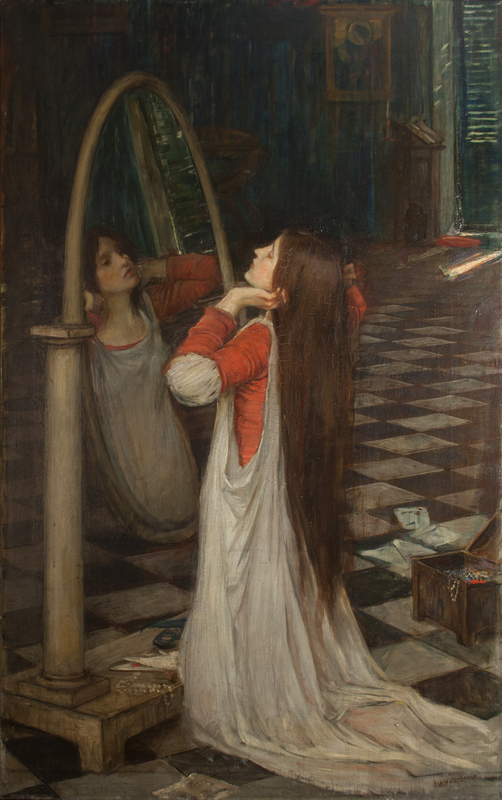 Although the Pre-Raphaelite Brotherhood are constantly popular today, when French was collecting in the 1890s they were somewhat out of fashion and therefore affordable in the art market. Burne-Jones was inspired by stories derived from literature and mythology, often with a damsel-in-distress at its core, and therefore associated with the Pre-Raphaelites. One of the first pictures in the exhibition is this large watercolour, Cupid and Psyche (1867). It is a Greek myth that the artist returned to numerous times during his career, using various compositions and mediums to explore the heart (Cupid) and soul (Psyche) of the love story. The mortal Psyche was the daughter of a king, and so beautiful that his subjects deemed her worthy of their worship over Venus. Enraged, the goddess of love and beauty sent her son Cupid to kill this challenger to her title, but he was so moved by her appearance that he fell in love with her. The tale is a loop of longing and passion which concludes with Psyche enduring horrible challenges under there service of Venus. In a final task Psyche is sent to Hades with a box to retrieve an ointment from Persephone that would render its user beautiful. Feeling ravaged by Venus’ trials and much suffering for Cupid, Psyche decides to use some of the ointment herself, but she had been tricked. The box contained the spirit of sleep which rendered her unconscious. Cupid finds her, recalls his love for her and removes the spell. This painting captures this dramatic moment in the story when having awoken his lover, Cupid bears Psyche up to take her to Venus. The drama of the scene is emphasised by a whirling wind that catches flowers in the air. The brushstrokes in the background are concentric and create a hazy fog, making our eye focus on the figures in the foreground. A swathe of Cupid’s rich orange-red frock is thrown into the wind to create an oval around the two heads, almost like a mandorla on its side. Wreathed and winged Cupid sweeps in to grab Psyche and the movement of their bodies causes ripples in their clothes. This echoes classical sculpture such as that found on the deities from the Parthenon, the study of which was elementary to the training of artists. The beautiful lithe figures, delicacy of line, smudgy-smoky texture and use of subdued colour are typical of Burne-Jones. He was one of the artists that would prove to be an influence on G. F. Watts himself. The Widow’s Prayer by Frederic Leighton (1830-96) is one of my favourite paintings in the exhibition. It depicts a very simple yet powerful scene of a woman in mourning. Leighton travelled to Venice many times, producing an abundance of sketches and studies to incorporate into future oil paintings such as this. Although the tenebrous atmosphere denies our eye a full view of the building, the domed ceilings and gleaming of gold mosaics are undeniably inspired by the interior of San Marco. Despite being dominated by shadow that unique warm light of Venice and the treasure trove feeling of the basilica cuts through the dark. 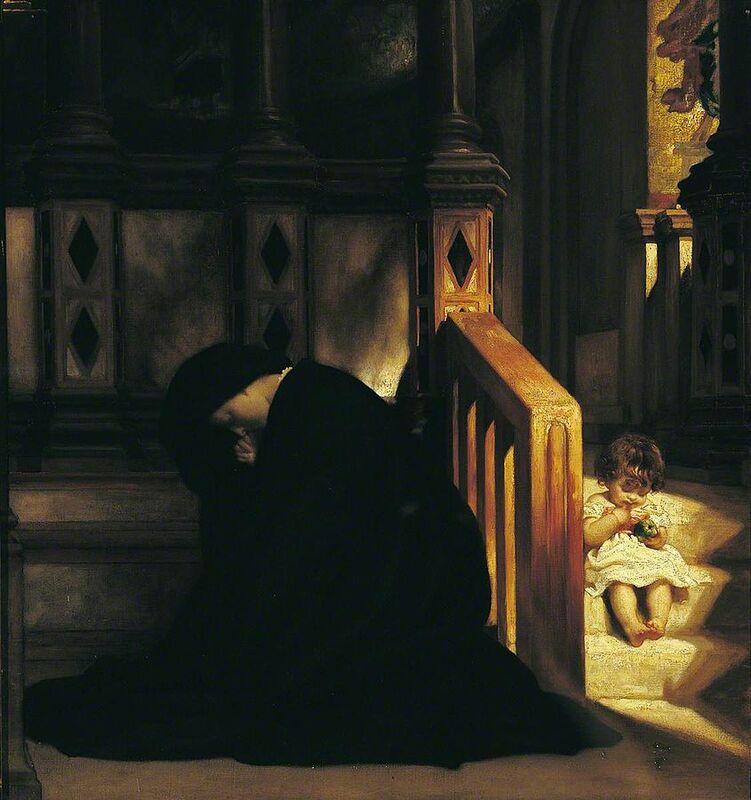 The division of light and shadow is encapsulated by the two figures; on the left the widow dressed in black, bent over in prayer and palpable sorrow, and on the right a small child sits on the sunlit steps, dressed in white, innocently contemplating an apple, she is a symbol of life. Leighton had trained with Eduard Jakob von Steinle (1810-86) part of the Nazarene group who had sought to revive a simplistic style of Christian art and would later influence the Pre-Raphaelites. Leighton developed a distinctly more academic style and preferred a less didactic choice of subject matter, which aligns him more comfortably with the Aesthetic movement of the 1870s and 80s. There is no specific message in the painting, but it is emotional and beautiful. The title describes what we are seeing but we are permitted to project our own ideas of onto it. The woman, presumably the child’s mother, will have to come to terms with her grief and push aside the heavy darkness to care for the young life she is responsible for. From our viewpoint we see that God has answered her by illuminating the child, the hope and happiness that will pull her through. In this melancholy scene a beautiful young woman kneels on a tiled floor before a large oval mirror. Sunlight filters through the shuttered window creating a shadowy atmosphere that conjures an echoey silence. An open jewellery box and letters are strewn on the floor, left where they have been discarded thoughtlessly. At the back of the room we see a x-framed (or Savonarola) chair in, a golden icon and a lectern beneath holding an open book. There is a red cushion on the floor in front of it, so that the girl could be picked up and put before it to study the book rather than her own reflection. This clever but subtle placement hints that despite her beauty she is isolated both physically and mentally, and the innovative composition gives us a double-view, allowing us a glimpse into what she sees in the mirror. Waterhouse includes visual details of Tennyson’s words, including the mirror, the religious painting on the wall, and old love letters. She gazes at her reflection with a forlorn expression, her youth and beauty are being wasted. The brushwork is loose and the colours are mostly dark, but the girl is pale and glowing, her red under-dress a vibrant coral colour. There is a Pre-Raphaelite-esque Medievalism about the painting, but like Waterhouse was never strictly speaking a member of the group. Like Burne-Jones and Leighton, he was connected with the Brotherhood, but did not adhere to the doctrines that the founding members set out. It is always a pleasure to see masterpieces from the late 19th century, but this exhibition is clearly about a collection that was a personal passion for its owner. There is a special connection in the location at Watts Gallery through the past Curator Rowland Alston, the man who oversaw the transfer to these works to current home at Hammersmith and Fulham Council. The selection of wonderful paintings and works on paper by both famous and lesser-known artists explores the legacy of the Pre-Raphaelites, which extends to Watts himself.